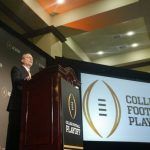 The college football odds on Alabama winning another national championship have further shortened after Ohio State’s surprising upset to Purdue. 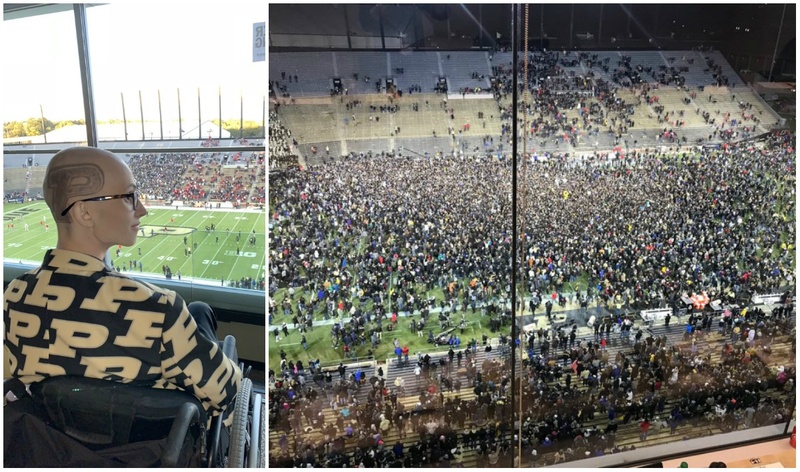 It was Purdue’s night on Saturday, as the “Boiler Up” nation was fueled by superfan 20-year-old Tyler Trent and his fight against bone cancer. Terminally ill, Trent predicted Purdue would upset the No. 2 team in the country prior to the Boilermakers welcoming Ohio State. Told you,” Trent said after the game. In what seemed like a story out of Hollywood movie, Purdue (4-3) had everything go in its favor. Up 14-3 at half, the Boilermakers extended their lead to 21-6 in the third and then dominated the fourth quarter. Purdue had an answer for two OSU touchdowns, and eventually won 49-20. With the loss, the Buckeyes fall to No. 11. The Westgate SuperBook lengthened their College Football Playoff National Championship odds from 6/1 to 10/1. The Crimson Tide easily took care of business at Tennessee 58-21. The 37-point win also covered the 28.5-point spread Alabama was giving the Volunteers. Alabama typically plays one of the toughest schedules in football being in the SEC, but this year coach Nick Saban’s squad has been afford a relatively easy campaign. The Crimson Tide have played just one ranked opponent in 2018, with the win coming at home against then-No. 22 Texas A&M. Following a bye week, the Tide will be formally tested when they travel to Death Valley to play at No. 4 LSU. The Tigers have the most wins against ranked opponents in college football, with victories over No. 8 Miami, No. 7 Auburn, No. 2 Georgia, and No. 22 Mississippi State. Las Vegas oddsmakers believe Alabama will still roll over LSU, as the Crimson Tide’s college football odds continue to shorten on their chances of defending the national title. With Ohio State’s loss, the SuperBook took Alabama’s title line from 4/7 (-175) to 2/5 (-250). For every $100 wagered, gamblers will net just $40 on that line. The odds imply a chance of Alabama winning it all at a staggering 71.4 percent. 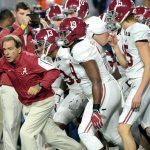 With Alabama the heavy favorite, the SuperBook gives few other teams much of a chance at winning the National Championship. Fresh off a dominating 41-7 win over No. 16 NC State, Clemson follows Alabama at 7/2. Should the Tigers win it all, bettors who back Clemson will be rewarded $350 for every $100 wagered. The line implies a chance of 22.2 percent. Notre Dame, now No. 3, trails at 7/1. 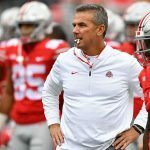 Ohio State is next at 10/1, then it’s Michigan and Georgia at 12/1. The Wolverines took care of in-state rival Michigan State 21-7, while the Bulldogs had the week off. Despite being No. 4 team in the nation, the SuperBook has LSU at 40/1 to win the national title.